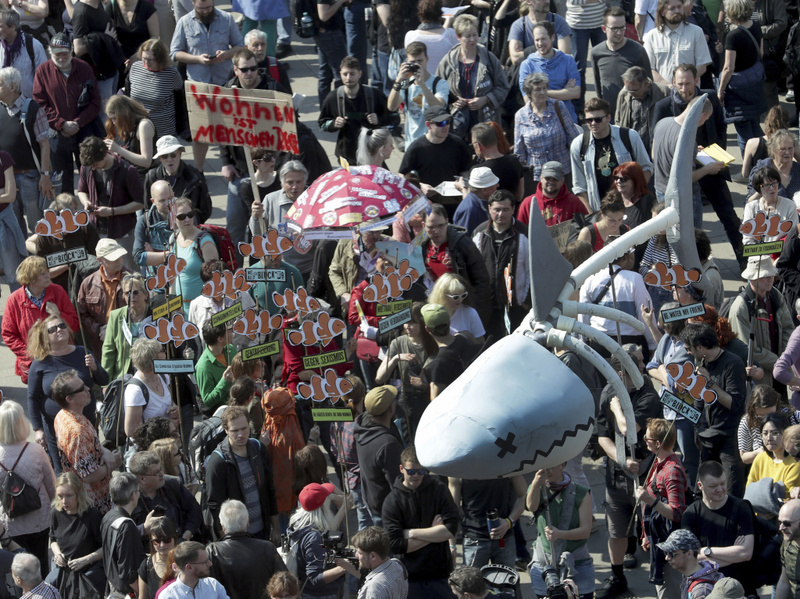 Protesters in Berlin carry a giant "rent shark" at a march against rent increases on Saturday. A skeletal shark wound its way through the streets of Berlin, pursuing unlikely prey – the city's renters. The makeshift "rent shark" was held aloft by participants in a demonstration against rent increases in Germany's capital city, Berlin, over the weekend. Thousands attended the march, which was organized by an affordable housing advocacy group in an effort to collect signatures for a proposal that would transfer some of the city's increasingly expensive residential rental properties to public ownership. If the group gathers enough signatures — about 20,000 — the city's government will have to consider a plan to seize more than 250,000 apartments from their corporate owners, The Associated Press reported. The proposal would target for-profit companies that own more than 3,000 apartments in Berlin. "These are companies that are coming in and seeing a really profitable market," Thomas McGath, a spokesperson for the group that organized the campaign, told NPR. "It's not your normal mom and pop landlord." Under German law, the plan technically could happen. Article 15 of the German Constitution states that "land, natural resources and means of production may, for the purpose of nationalisation, be transferred to public ownership." "At the beginning, some of the fathers of the constitution thought, 'Well, there could be a situation where the market ... gets out of control and then it could be important to get this regulation," Ralf Schoenball, a reporter for the German newspaper Der Tagesspiegel, told KCRW Berlin. But Schoenball said the article has never been used before. Berlin's property market isn't the priciest in Europe — or even in Germany — but it has grown rapidly in recent years. According to a report by Deutsche Bank Research, house and apartment prices in Berlin were up about 10 percent year over year in 2017. The advocacy group has named its campaign "Expropriate Deutsche Wohnen & Co," which translates as take possession of the real estate company Deutsche Wohnen, which owns about 160,000 residential and commercial units. "There are a lot of stories about the Deutsche Wohnen ... that they raise rental fees, that they try to get rid of tenants with old contracts with low rental fees," Schoenball told KCRW Berlin. "A lot of tenants are afraid that they could be put out of their apartment." The company's CEO, Michael Zahn, told AP the advocacy group's efforts wouldn't do anything to alleviate the city's housing crisis. "Expropriation is creating a lot of emotions right now," Zahn told AP in an email. "But it won't create a single apartment." AP also reported that the company said, on average, its apartments are about 645 square feet and cost about the equivalent of $650 to rent, and that the company follows government rules for calculating permissible rent increases based on neighborhood averages. If the campaign can pass its first hurdle and collect 20,000 signatures, the city's government will be tasked with drafting a counterproposal that satisfies the grassroots group. If the government fails, the group will need to rally another 170,000 signers to move the proposal to a referendum and then to a ballot, where a majority will be required to pass it.